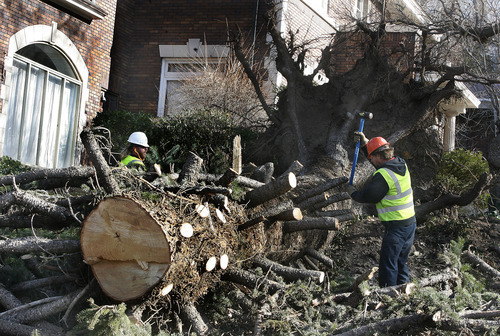 The day after a massive windstorm sweeps through, Utahns are catching their collective breath and beginning the long, costly process of cleaning up. Steve Griffin | The Salt Lake Tribune A motorist stops on I-15 to secure cargo in his truck bed as high winds whip through Centerville on Thursday. 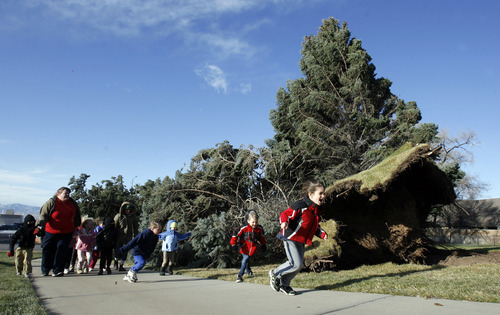 Francisco Kjolseth | The Salt Lake Tribune Kindergartners from the Jewish Community Center take a quick field trip to the front of the the center on Thursday to check out the large pine that was knocked over by strong winds. 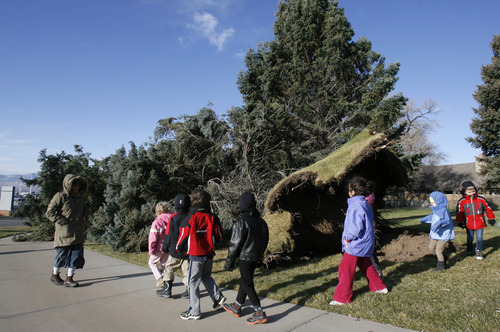 Francisco Kjolseth | The Salt Lake Tribune Kindergartners from the Jewish Community Center take a quick field trip to the front of the JCC on Thursday to check out the large pine knocked over by strong winds. 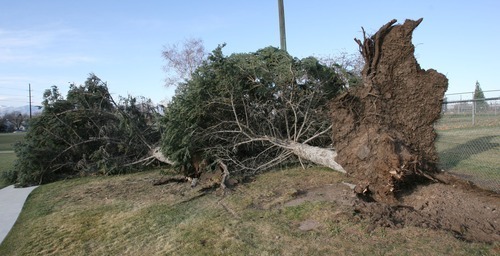 Francisco Kjolseth | The Salt Lake Tribune Several large pines at Sunnyside Park were toppled on Thursday when high winds hammered the state. 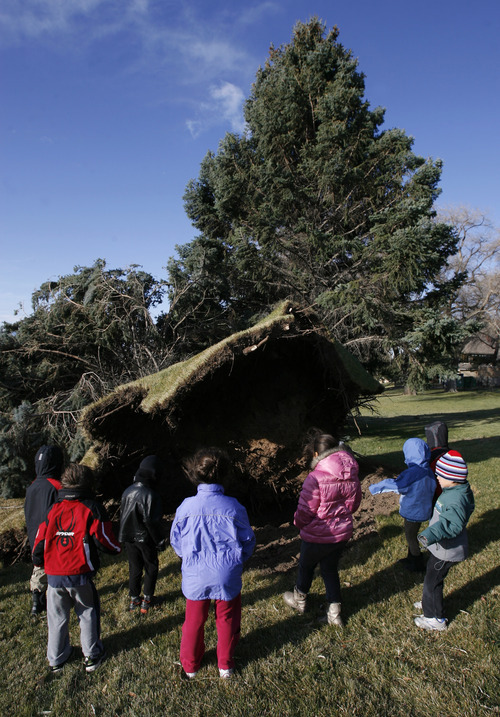 Francisco Kjolseth | The Salt Lake Tribune Kindergartners from the Jewish Community Center take a quick field trip to the front of the center on Thursday to check out the large pine that was knocked over by strong winds. Steve Griffin | The Salt Lake Tribune A motorist and Utah Highway Patrol trooper run to a semitractor trailer that had just been blown over by high winds near Farmington Thursday. 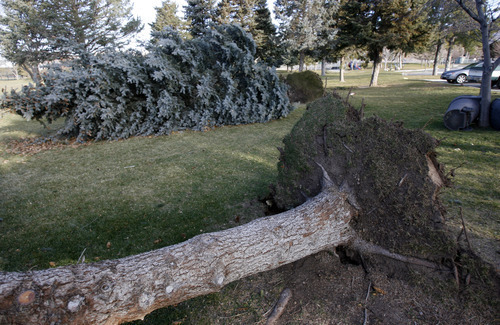 Steve Griffin | The Salt Lake Tribune High winds downed pine trees at Sunnyside Park in Salt Lake City on Thursday. 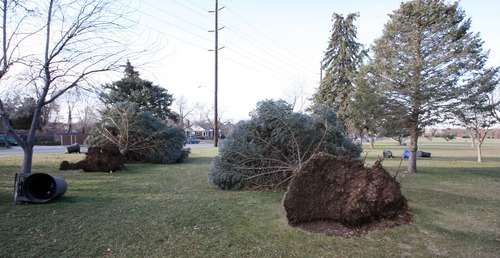 Steve Griffin | The Salt Lake Tribune Pine trees at Sunnyside Park in Salt Lake City were toppled on Thursday by high winds. 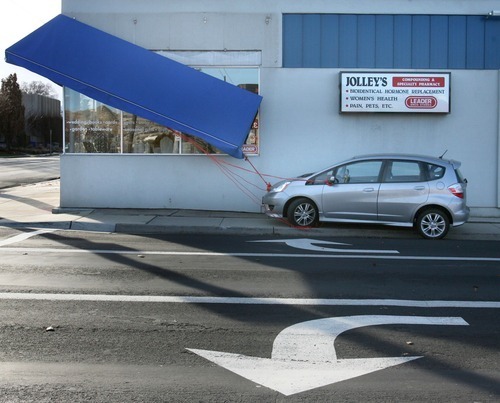 Steve Griffin | The Salt Lake Tribune An awning at Jolley's Corner Pharmacy in Salt Lake City is tied to a car on Thursday to prevent it from blowing away. 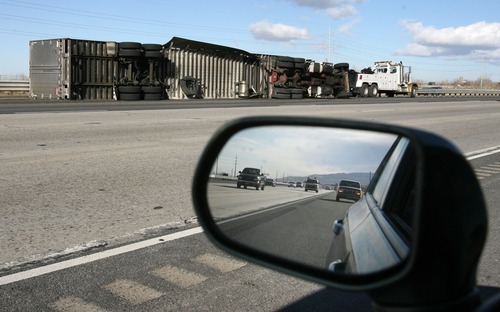 Steve Griffin | The Salt Lake Tribune A semitractor trailer lies on its side after being blown over by high winds on I-15 near Centerville on Thursday. 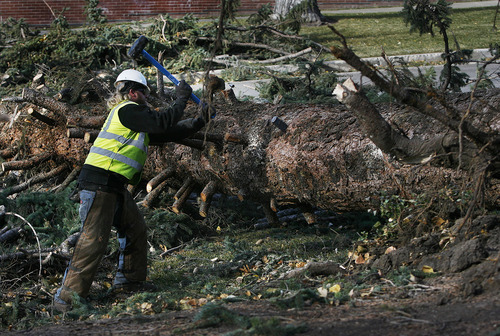 Scott Sommerdorf | The Salt Lake Tribune Tyler Bacus, left, and Len Jaynes work to cut up a 70-foot pine tree that fell early Thursday morning at South Temple and T Street. Scott Sommerdorf | The Salt Lake Tribune Tyler Bacus drives a wedge into the trunk of a 70-foot pine tree that fell in the early hours of the morning at South Temple and T Street Thursday. Bacus and Len Jaynes worked to clean up the tree that had fallen across T Street. 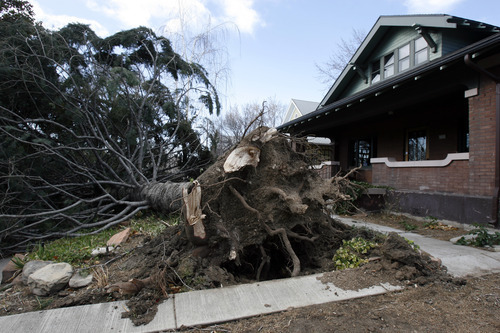 Francisco Kjolseth | The Salt Lake Tribune A large pine at 1121 E. 200 South in Salt Lake City was uprooted by the wind storm on Thursday. 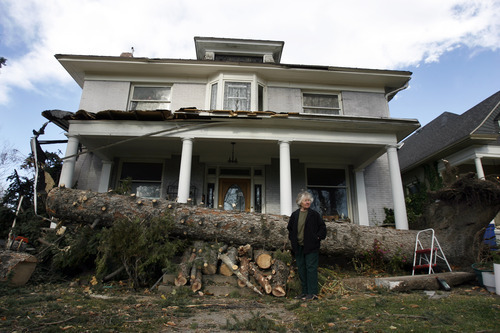 Francisco Kjolseth | The Salt Lake Tribune Merla Swenson, 82, overlooks the damage created to her home of 30 years at 1133 E. 200 South in Salt Lake City on Thursday. Early Thursday morning, the large pine in front of her home toppled from high winds, a tree beloved by her husband, who passed away 1 month ago. Swenson was in the process of painting her home so she could get home owners insurance coverage. 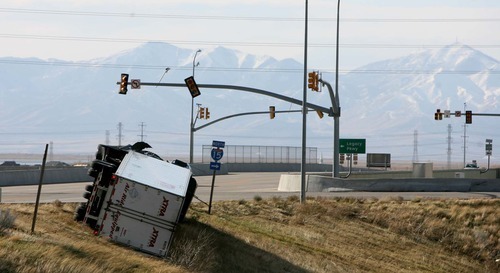 Leah Hogsten | The Salt Lake Tribune A semitruck toppled in the wind on Park Lane in Farmington. Hurricane-force winds, in places topping 100 mph, ripped through Utah on Thursday, overturning semitrailer rigs on Interstate 15, toppling trees and triggering widespread power outages affecting nearly 50,000 homes and businesses. Farmington • Wendy Garrard on Friday surveyed the scattered remains of her collection of small plastic snowmen. There had been about a dozen snowmen lining her walkway; all but five of the decorations were casualties of the massive windstorm that swept through Davis, Weber and Salt Lake counties on Thursday. The winds, topping out at 102 mph in Centerville, toppled 16 semitrailers, injured one teen, closed schools and triggered widespread power outages and a state of emergency in Davis County. As officials sorted through the leftover mess, northern Utahns began the daunting tasks of cleanup. Many of those who escaped damage, pitched in to help those who weren't so lucky. Safe inside her home Thursday morning, Garrard said she watched the shingles and siding fly off her house and garage. "It was kind of scary out here because the wind was blowing so fast and hard," she said. As large branches fell in the roadway, she said a police officer stopped to clear them off. Volunteer city firefighters also stopped by later in the day to help clean up trees cluttering sidewalks, she said. Several blocks away, volunteers with a local LDS Church ward used chain saws to cut up a large tree that fell into Annette Smith's yard from her neighbor's. Smith said her daughter, whose birthday happened to be Friday, was celebrating having an impromptu day off from school after Davis County closed schools for the day. She said her home lost shingles and a strong gust of wind blew out a window on her van while she was driving. She said she had spoken with her insurance agent who told her it would be a while before an insurance adjuster could come out because there were so many other claims, but that they'd be reimbursed for repairs they made in the meantime. The City of Centerville has estimated $8 million in damage, including residential, commercial and city utilities, said city spokesman Cory Snyder. Of the city's 5,000 or so homes, 60 percent of them suffered some sort of damage to the structure or surrounding property, Snyder said. In Farmington preliminary estimates range from $4 million to $6 million citywide. City Manager Dave Millheim said four large private businesses alone including Lagoon Amusement Park and Oakridge Golf Course could top $2 million in damages. Davis County Emergency Management spokeswoman Susan Poulsen said damage figures are expected to climb as reports continue to come in. Poulsen said emergency staffers met throughout Friday with representatives of all cities in the county. It will take "days, if not weeks" before county officials have a good overview of windstorm damages, Poulsen said, but as of Friday they already had confirmed that damages to public property alone had topped $3.5 million, which is the threshold for declaring a state of emergency. Gov. Gary Herbert issued a statement Friday in which he commended the "swift, coordinated and effective response" of city and county governments, utility crews and others. Herbert urged "Utahns to demonstrate Utah's culture of volunteerism" by assisting those affected by the storm. He added: " ... we have plans in place to assess damage and determine if and where additional public resources are needed. The concerted effort of local, county and state responders will go on as long as is necessary to restore services and insure personal safety." The region escaped wind-related fatalities, but a Bountiful couple in their 40s was hospitalized Friday morning after being overcome by fumes from a gas-powered generator at their powerless home near 250 South and 100 West. The couple was released from the hospital early Friday afternoon and are "doing fine," said South Davis Metro Fire Chief Jim Rampton. In Salt Lake City, a 13-year-old boy was injured Thursday morning while walking his dog near 800 East and 300 South, when a tree limb fell on his head. He remained in critical condition at University Hospital on Friday. To combat power losses that affected more than 50,000 residents at one point Thursday, Rocky Mountain Power crews brought in additional crews to expedite the process. As of 11 p.m. Friday, about 2,200 customers were still without power along the Wasatch Front. Approximately 407 customers were without power in West Bountiful and Salt Lake City, as were 1,817 customers in Ogden, Roy, and Uintah. About 350 Rocky Mountain Power crews worked through the night in shifts to restore power to affected areas. "We expect to have most customers back on by sometime Saturday," said spokesman Jeff Hymas. Insurance agents throughout the affected area were swamped, with many offices contacted in Davis County on Friday reporting that all agents were out handling claims. David Hoggan, a senior claims representative with American Family Insurance, who was already out appraising wind damage in Layton on Friday afternoon, said the storm mainly caused damage to shingles and knocked down trees and fences. He said there was not a lot of structural damage. Hoggan said his insurance company was estimating the storm easily will cost them $1.5 million in damage. He said before noon Thursday, he had already been assigned 20 wind-related claims, in addition to the regular claims that continue to come in. He said a special team would be arriving in Utah on Monday to work only the wind-related cases. C. Wilson Green, whose Kaysville agency is part of the state Fire Insurance Exchange  one of the top three home insurers in the state  estimated his office had received up to 80 claims before noon and expected more as clients called in through the day and into the weekend. "It seems everyone has had trees that have fallen over. We're getting a lot of claims for shingles blowing off, fences blown over, and miscellaneous things like chimney damage, patio furniture and damaged wood decks and storage sheds," Green said. Centerville resident Phil Daniels said he was helping his neighbors clean up before focusing on his house. Friday afternoon, he was on his 10th trip to a city disposal site to help move storm debris out of his neighborhood. Daniels said flying shingles from his neighbor's roof, damaged two of his windows. He said he chased his blowing garbage and recycle bins down Main Street. The recycle bin vanished to parts unknown. Winds were so strong, he said, that they actually managed to move his heavy-duty barbecue. Also out Friday was general contractor Jeff Cook, whose employees were hard at work removing 70-foot and 40-foot trees that had fallen on a Centerville home. He said it would likely take two or three days to remove the trees. He said some tree cutters he knew had received more than 100 calls before 10 a.m.
"I think this is more tree damage and power line damage than I've ever seen," he said. "There's more calls than we can handle. Workers are in as short supply as chain saws and generators." The Utah Transit Authority's FrontRunner services were back in operation, but the wind-damaged Farmington station in Davis County remained closed. By Friday night, the American Red Cross had closed all shelters because power had been restored to the majority of homes.